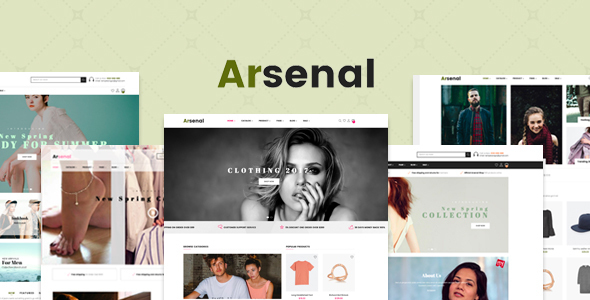 At Arsenal Fashion Store Multiple Responsive Prestashop Theme is a wonderful theme in Prestashop 1.7.4.x – the newest version at this moment with full features of online store. It was designed for diversified commodities like Clothing store, fashion store, shoes store and multiple stores. This is totally responsive so it is completely adjustable for any kinds of devices (desktop, laptop, tablet, mobile phone) highly customizable prestashop theme. At Arsenal Fashion Store Multiple Responsive Prestashop Theme also supports Trendy Mega Menu, Theme Editor, One Step Add To Cart to help customer browse and manage easier and faster. CSS3, HTML5, RTL language layout and Bootstrap 3 Framework also creates refined web pages with high level of accuracy.